Flickr: Don NunnOregon Coast Hwy sprawls over the Columbia River at high tide. For sheer amusement value, that would be my friend Sonya’s reply my story of how I had mistaken an Applebee’s location in Glendale, AZ, for the Chili’s location I was trying to find. What’s the best text message you’ve ever gotten? This would probably depend on where I was when I got arrested, and possibly on why I’d been arrested. In Seattle I’d probably call my sister. She also lives in the Seattle area, and I’d rely on her to call our mom and other family or friends as required. If I was in Salt Lake City, or pretty much anywhere other than Seattle, I’d probably call my mom in SLC. I don’t know why that is, other than that I think parents tend to be better at dealing with things long-distance. Though so far as I know my parents have never arranged bail bonds nor legal services, locally or otherwise. So I don’t know why I think this. On Vox: QotD: Worst. Hairstyle. Ever. This would be when I was going to school in California in 1990–91 and decided, after one particularly bad haircut, not to cut my hair for the remainder of the school year. By May 1991, when I hadn’t had a haircut since... late Sep 1990, my hair was shoulder-length and astoundingly stupid-looking. We have photos of me from that era. I should find a couple of them and scan them for everyone’s amusement, though I’m not sure I want to open myself up to the endless ridicule I know it would generate. What was your worst hairstyle decision ever? I’m getting a haircut this morning, so of course I wore a white shirt today. Little hairs everywhere all damned day. On workdays, I set my phone alarm for 22:00. My work shifts start at midnight so 22:00 gives me plenty of time to wake up, shower, get dressed, and leave for work without having to rush at all. I usually wake up before the alarm anyway, so it’s more of a fail-safe than a requirement. I never use the snooze function. When the alarm goes off, I usually get up immediately; or if I don’t, I rely on staying awake because the alarm usually scares me awake and I don’t want to be scared repeatedly. On non-workdays, I set the alarm based on whatever plans I have for the day. Still no snooze button, though. What time is your alarm clock set for? Do you use the snooze button? Leaving work in the next little while. Looked at my calendar for today and the weekend. Thinking: When am I going to sleep this weekend? Friday: Edmonds Arts Festival (Upcoming event page, show your status! )—a recent favorite annual arts festival. Getting a bit more crowded each year but still easy to see the entire thing in a single day. Saturday: 2007 Washington Brewers Festival (Upcoming)—best local brewfest, and this year it’s back at Saint Edward State Park in Kenmore, a particularly good venue for the festival’s size. Sunday: ZooTunes: Indigo Girls (Upcoming)—this will be the... third? fourth? anyway, seen them several times, never disappoint. I love their harmonies. I haven’t been to the Zoo’s concert series before, in fact only been to the Zoo once and that was several years ago. Really looking forward to this one. I may be utterly wiped out for my Monday work shift, who knows. So long as I’m not hungover from the brewfest, I should be able to get some sack time Sunday morning or early afternoon. Wired gallery of a San Francisco office set up to look like the Nautilus from 20,000 Leagues Under the Sea. Octopus sofa! 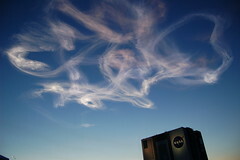 The contrail from Atlantis’ launch catches the last rays of sun as it drifts high over the Vehicle Assembly Building. YouTube - Dog and Duck are Best Friends ! Flickr: Don NunnBike from The Land of WTF under the stairs at the north end of the building. For most of the time I was home today, I had iTunes feeding my living-room and bedroom stereos via AirTunes. Makes for good audio distraction when I try to sleep in the afternoons on weekdays, I’ve found. Tonight I thought, hey, I wonder how many songs played today, including while I was using my iPod at work this morning. So I created a Smart Playlist to show me all the songs played today, scrubbed the list through Excel to make the formatting prettier (all hail the CONCATENATE function), et voilà. More than 12 hours of music, about half of which I slept through, listed in play order. Windows utility detects random keyboard input, assumes feline chicanery, intervenes. I can’t tell if this is a real product or not. Distance and speed - 3 on Flickr - Photo Sharing! Flickr: Don NunnGot an email a few weeks ago from an editor for csma’s Motoring & Leisure magazine, they wanted to use this photo for an article in their June 2007 issue and would I grant permission? The photo appears on page 33 of the issue, part of the “On the Road” column. This month’s article is about the necessity of “running in” a new vehicle’s engine to ensure smooth operation throughout the vehicle’s life. I was surprised to receive my first bill from Seattle City Light on Saturday. The bill was only $27.01, $16 of which was listed as “Account Setup”—I guess it takes quite a bit of effort to type a new name and phone number in the billing system. This bill covers service from April 15 to May 22, 197 kWh at $0.0376 per for $7.41 in actual energy cost. The remaining $3.60 is the “base service charge,” which covers who knows what. The little “Compare Your Electricity Usage” graph shows a bit over 5 kWh daily average consumption, which matches the 37-day billing cycle and the total kWh used. Probably a combination of these factors and the short billing cycle this time around. Looks like Seattle City Light uses a bi-monthly billing cycle like I had with Snohomish County PUD. I’ll be curious to see how my next City Light bill comes out. Two. One in the living room, one in the bedroom. The wine is sold by the bottle! Saw Harry Connick, Jr. at Chateau Ste. Michelle last night, the opening show of their 2007 Summery Concert series. Before the show last night, I had only been to Ste. Michelle once, in March 2006 with my friend Matt for a winery tour. Now I’ll be watching their annual concert announcements closely because the place makes a damned fine performance venue. Went to the show with Matt, he invited me a few weeks ago. I was a pretty big fan of Harry Connick, Jr.’s music in the early to mid-1990s, when We Are in Love and Blue Light, Red Light were among his most recent releases and I was just starting to expand my music collection beyond idiot pop and Top 40. And not that I got very far with that expansion; it’s a long slow ongoing process. For a while there those two CDs were in regular rotation in my car stereo and in my first CD changer, but after that my only exposure to the man was in the different acting roles he took. Show started at 19:00 (actually a little late), doors opened at 17:00. Matt had to work until 17:00 though so we didn’t arrive at the winery until a little after 18:00, which meant we were at the back end of the general-admission area. That was fine; we could hear perfectly and we had a good line-of-sight view over the crowd’s heads. We were close enough to the back fence that we could stand up without blocking anyone’s views, so we ended up standing back there for the last 20 minutes of the show, which also gave us a good vantage for scanning the stage with our binoculars. Speaking of which, if these venues are going to have stated rules regarding maximum allowed chair heights, they should enforce the damned rules. There were many people with chairs higher than 28 inches seated closer to the stage than we were, and there was no one moving them to the rear of the venue as the general-info rules indicate would happen. Didn’t cause us much trouble with the views but I’m wondering why the bag checks at the entrance didn’t also check seat sizes. Ah well, on to the show. I hadn’t seen Connick perform live before, but I have seen bands perform in New Orleans, so I expected a pretty laid-back atmosphere. Exactly what we got: Connick, an amazing keyboardist and a talented singer, kept the show moving at a leisurely pace and in many of the songs allowed his band members to shine. Very self-effacing, and he engaged the audience in chatty banter a few times too. Toward the end he begged the staff to open the area directly in front of the stage so people could dance, and they did it. Probably freaked out the security folks but the band clearly enjoyed the bouncing and arm-waving crowd that was so obviously into the show. Best part? I knew they’d sell wine—obviously, you can’t host a concert series at a winery without selling the place’s wares—but it never occurred to me they would sell by anything other than the glass. They sold only by the bottle, and there apparently were no limits on what individuals could purchase. We had two bottles, the 2005 Indian Wells Riesling, that we bought one at a time over about two hours. Other people, though, were walking around with four or five bottles in hand, and there was one group of three people seated about 15 feet ahead of us where the one guy went through two bottles by himself in just the 45 minutes or so between our arrival and the show’s start. They smartly closed down wine sales a little before midway through the show and there were no overtly drunken patrons as we all streamed out of the venue. I wonder exactly what type of liquor-license magic they had to conjure to allow such relaxed rules. I left my cell phone in the car, so I couldn’t flout the repeated warnings that photography of any kind was strictly forbidden by overtly snapping images and mailing them to the world immediately. I was most distressed by that. We had stopped at the Rite Aid in Woodinville so Matt could by sunscreen because he burns easily, and the entire general-admission area was in shade by the time we arrived. Better safe than sorry, I suppose. For example, if it’s a scoop at home, I usually have vanilla with a little caramel sauce. But I also have a pint of Ben & Jerry’s Mint Chocolate Cookie in the freezer, it’s one of the flavors I quite enjoy when I’m in the mood for it. If I’m having ice cream with something else, say as part of an à la mode dessert, it’s usually vanilla. Goes so well with the cobblers or similar things I have now and then. If it’s bars, the basic ice-cream sandwich (vanilla ice cream, chocolate sandwich pieces) is the way to go.